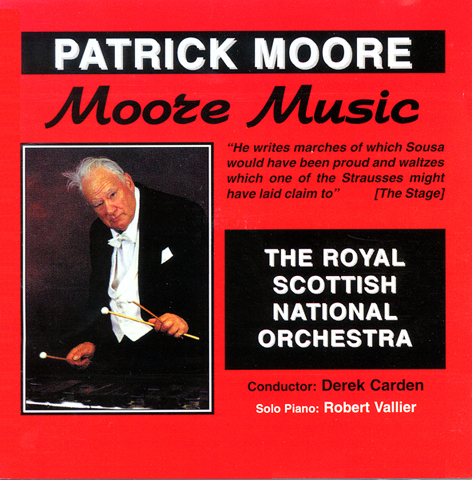 Robert plays the only solo piano track on this CD of Sir Patrick Moore’s music, entitled ‘Moore Music’. 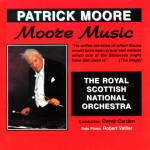 The CD was recorded in Glasgow, UK, with the Royal Scottish National Orchestra. Hear Robert talk on the BBC about his lifelong friendship with Sir Patrick Moore. Although one of his earliest compositions, the Nocturne in D flat remains one of Patrick Moore’s finest works for solo piano and reveals the composer’s love of Chopin and the Romantic Composers. The work begins very simply with a flowing melody in D flat which sings its way over a broken-chord accompaniment. This tune is repeated with embellishments before a new theme is introduced, this, again, a simple melody with decorations. The whole atmosphere of the music is one of calm meditation. The middle section of the piece, in the relative minor, begins to grow in stature, using a wider range of the piano keyboard. As we return to the opening theme the music suddenly blossoms into decorative rhapsodic passages and a tremendous expansion of the dynamic and melodic ranges; it makes one yearn for more but – as suddenly as it came – it is gone, and the piece ends with a series of trills and gentle final chords.